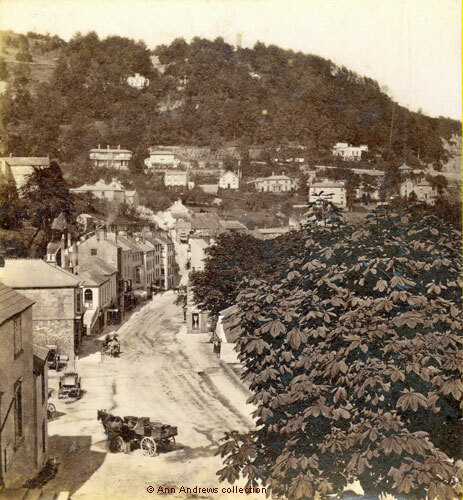 A high quality stereoview taken by the Matlock Bath's first resident photographer, John Clarke, who lived on South Parade. He must have been standing outside the entrance to the Royal Hotel to take his pictures, possibly whilst the hotel was being built. His studio was on the right of South Parade, past the Buxton's Royal Museum. The Museum is the building with a display in the side window. Next to it, towards the camera, are the former Fishpond Stables although they are mostly hidden by the large horse chestnut tree. A low stone wall borders the fish pond. At the bottom of the hill immediately below the camera is a man with a horse and cart which is stacked with wicker baskets, possibly selling vegetables. There appears to be a customer standing next to him. The Fishpond Hotel was on his left and several carriages are standing in the hotel's forecourt. There is a pony and trap is a little further along the road. On the hillside above are several large villas, including Guilderoy, Masson Cottage and Belle Vue with the Lower Towers at the junction of Masson and Holme Roads. Higher up is the Upper Towers with the Victoria Tower on top of the hill. On the corner of Waterloo Square and West Bank, looking down The Pitchings, is a building with a large brick wall frontage which has a sign -- -- | Tea Rooms | Warehouse. This was later the Hillside Cafe. Stereoview "Matlock Bath" from the collection of and © Ann Andrews. Information researched by and © Ann Andrews.